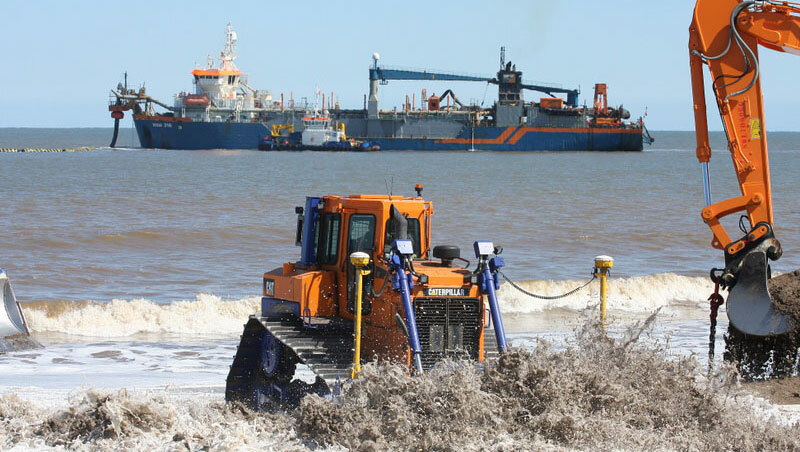 Around 400,000 cubic metres of sand will be pumped onto Lincolnshire’s beaches to reduce flood risk to more than 20,000 homes and businesses, 24,500 static caravans and 35,000 hectares of land in a massive Environment Agency-led project being delivered by Team Van Oord. The Lincolnshire Beach Management project involves the raising of beach levels lost naturally to the sea, by dredging sand from the seabed and pumping it onshore. Sand is dredged from a designated offshore location using a Trailing Suction Hopper Dredger. The material is then pumped to the shore via a floating pipeline, to replace sand lost during winter storms. The work forms a key part of the Environment Agency’s management strategy for the Lincolnshire coast. The 2018 works got underway on 30 April at Boygrift, and over an eight week period the dredger will move to Trusthorpe, Mablethorpe, Ingoldmells, Trunch Lane, Wolla Bank, Chapel Six Marshes and Huttoft to complete the 2018 works. The HAM316 dredger, owned by Team Van Oord partner Van Oord, has the lowest carbon footprint of its class. It is operating continuously, delivering approximately 5,000 cubic metres of sand twice a day. “Our work to restore beach levels is important as it protects coastal defences, such as sea walls, from the energy of the waves as they impact on the coast. “Our defences along the Lincolnshire coast help us reduce coastal flood risk to tens of thousands of homes and businesses as well as significant areas of agricultural land. By replenishing beaches, we extend the defences’ life. The Lincolnshire Beach Management 2018-2021 scheme is the latest phase of work to protect the Lincolnshire coast, which has been ongoing since 1994 under the name ‘Project Lincshore’. With storms and flooding becoming more frequent and sea levels rising due to climate change, the Environment Agency has recognised a need to review whether the current coastal flood risk management approach will be sustainable in the long term for Lincolnshire. The agency has therefore been consulting with the public on six coastal flood risk options to work alongside beach nourishment as part of the Saltfleet to Gibraltar Point Strategy. This strategy will set out the most sustainable way of managing flood risk on this stretch of coast from 2021 to 2121. A draft strategy will be taken to consultation this summer. Click here for more details on the strategy and further information regarding times and locations of beach nourishment works.